Electricity and Data need to get from point A to point B. It is with these devices that this is accomplished. Here are a couple of notes about electricity that will be useful. 1 – It is dangerous. Don’t do anything that you are not trained and qualified to do. 12 gauge – can handle up to 2400 watts though I recommend limiting it to 2300 watts. 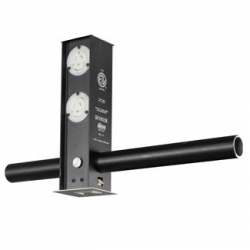 14 gauge – can handle up to 1800 watts though I recommend limiting it to 1725 watts. 16 gauge – can handle up to 1000 watts though I recommend limiting it to 750 watts. 3 – Cables generally have three wires with a green, a white and a black. The green is the ground. The white is the neutral. The black is the hot. If there are multiple hots then they will also be red and blue. Do not mix and match these colors. Edison plugs are the connectors we most commonly use in our homes. This is a picture of a 15 amp edison plug. A 20 amp edison plug will have one of the blades go sideways. A female edison plug can accept both a 15 and 20 amp male connection. Browse our selection of Edison plugs. 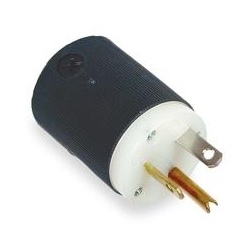 Stage Pin Plugs are designed for the theatre are generally 20 amp and very quick and easy to install and use. Browse our selection of stage pin plugs. 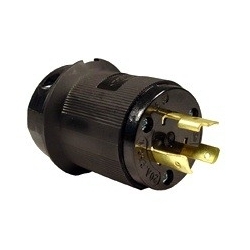 Twist Lock plugs can also be purchased in a 15 and 20 amp variety. The ground blade will have a tab that usually goes inwards towards the center of the plug. There are some older styles that have that tab going outwards. This is usually referred to as nub in and nub out. Browse our selection of twist lock plugs. Feeder cable plugs are for connecting the main source of power to your system. They are only for one “leg” of the power whether it be the hot, neutral, or ground. Browse our selection of feeder cable plugs. An adapter lets you go from one style of plug to another style while still keeping the hot, neutral and ground in their proper order. Browse our selection of adapters. Also known as extension cords, these simply provide a way get to a power source that is farther away then the cord on your unit allows. No matter what type of plug you use they all work the same. These are generally made in stock lengths of 5, 10, 25, 50, and 100 feet. Browse our selection of power cables. Control cable lets you get control signal from point A to point B. As electrical cable they can be joined together to make longer lengths. Browse our selection of control cables. A twofer or threefer is a device that let’s you split your electrical distribution. 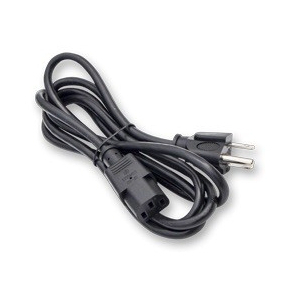 Generally one male to two or three female plugs then lets you power more then one device from one circuit of power. Browse our selection of twofers & threefers. Feeder cable is very large individual power cables that lets you bring the main source of power to your dimmer rack or either electrical distributing devices. Browse our selection of feeder cables. Multicable is cable that has multicable circuits inside an outer casing. It is much faster to run six circuits in one cable from A to B then six individual cables. Browse our selection of multicables. A cable cradle is a device that helps hold drooping cables in a particular shape. 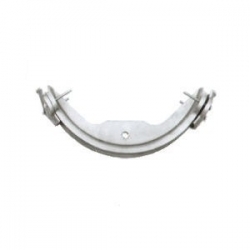 Browse our selection of cable cradles. Cable ties and tie line are tools that let you “tie” your cable in place to keep it neat and clean and free from catching on things. Browse our selection of cable ties & tie lines. Electrical distribution is a more permanent way of distributing circuits in a theatre. It still brings the electricity from point A to point B it is just that point B is a permanent location. That location is generally a place where you almost always want to have some circuits. Pipe distribution boxes are simply different box configurations that you can mount on your pipe in your theatre. Browse our selection of pipe distribution. Wall boxes are just like a floor box but mounted on the wall. 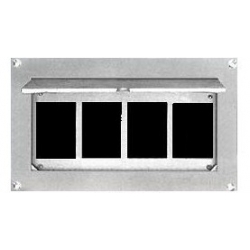 Browse our selection of wall boxes.